Cross country skiers have not been forgotten in the Adirondacks. 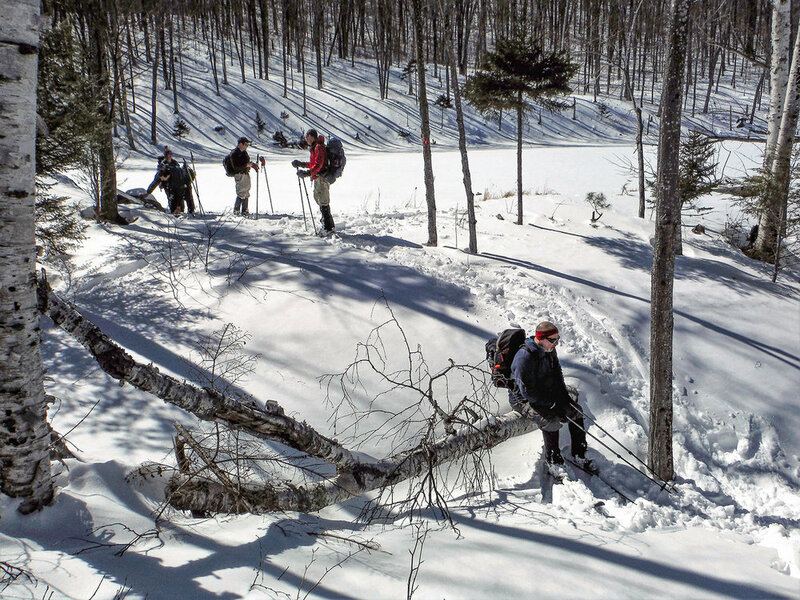 The Adirondack Park Agency and the Department of Environmental Conservation are working on a guidance plan to update ski trail design, construction and maintenance on NYS Forest Preserve lands. Designated ski and ski/hike trails will be placed into three categories: “Ski Touring Trails” will generally be six to eight feet wide, steeper “Backcountry Ski Trails” will be eight to nine feet wide, plus there will be a “Skin Tracks” category for steep uphill travel. A public comment period ended on February 1st. New areas of state land, such as the Boreas Ponds Tract, offer the winter adventurer new experiences and opportunities for exploration. Changes occur from time to time on new and old state lands and I will cover some of these here. In the greater Lake Placid area, skiers should take note that the Whiteface Veterans Memorial Highway toll road is being plowed on weekdays for work that is being done near the summit. Also, a court decision has determined that the Mountain Road section of the Jackrabbit Trail, which passes through the Sentinel Range Wilderness in between Lake Placid and Keene, is a town road and was never abandoned. Thankfully, the towns at each end do not plan to open the road/trail to motorized vehicles so skiers can enjoy this section in peace as they have done for many years now. Quite a number of folks have been skiing Gulf Brook Road to access the Boreas Ponds and their inimitable view of the High Peaks. The state does plan to build a 7.5-mile ski/hike trail to the ponds sometime in the near future and Gulf Brook Road will likely become a snowmobile trail. An accessible lean-to will be erected at the ponds later this year. Not everyone likes skiing on a road or doing a 14-mile round-trip, so there are other options in the area. To the east, west of Elk Lake Road, is the Ragged Mountain Road that generally follows The Branch and its scenic rapids in a northerly direction – skiing is easy as you gain about 250 feet in the first two miles. To the west of Gulf Brook Road, in the Vanderwhacker Wild Forest, a new trail leads 2.3 miles to a recently built lean-to at Wolf Pond. The skiing is intermediate in difficulty, and the pond lies just three miles south of the Boreas Ponds, so has similar views except that the peaks are just a bit more distant. The start of the trail is on the east side of the bridge over the Boreas River. Another new addition to the High Peaks Wilderness is the MacIntyre West Tract in Tahawus. The trailhead is the same as the Bradley Pond trailhead that hikers use to access the Santanoni Range. Skiing is on a woods road for the first four miles but trails lead off to places such as Lake Andrew. The hunting camps in this tract were to be removed by September 30, 2018 but a few still remain to be dismantled as of this writing. For the adventurous, a long through trip is possible over to Newcomb Lake and the Santanoni Great Camp. 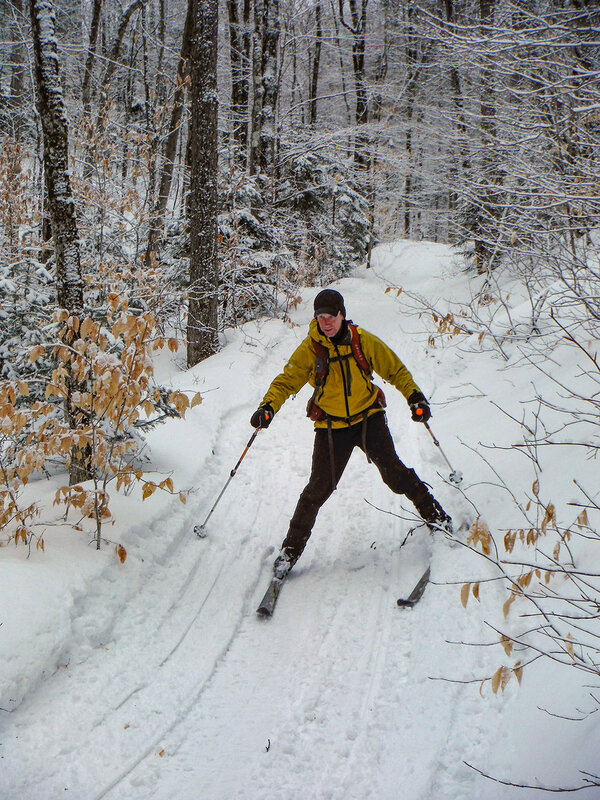 In nearby Newcomb, skiers can enjoy the woods roads of the Essex Chain Lakes Complex. From Goodnow Road, ski on Chain Lakes Road North for 1.3 miles, then take a right. After another 1.2 miles, a road leads right and continues along the west side of Sixth and Fifth Lakes, then a left turn brings you to the culvert between Fourth and Fifth Lakes. The camps of the Gooley Club have been removed from the east shore of Third Lake and an accessible lean-to is planned for that site in the future. The skiing is good for novice skiers. Also starting on Goodnow Road is the relatively new Upper Hudson Loop Trail, a 4.2-mile lollipop route good for intermediate skiers that takes you past a wild section of the Hudson River. Heading south to North Creek, recent plans for changes to the Gore Mountain ski area called for expanding into the Vanderwhacker Wild Forest, around the area of Rabbit Pond. After DEC received a small number of comments on the matter from myself and a few others, I believe we were able to save Rabbit Pond and its trail, which connects with the Raymond Brook Ski Trail and the Ski Bowl Connector Trail. The combination offers some of the best skiing in the Adirondacks for advanced intermediates and expert skiers. The Raymond Brook Ski Trail has a 1,300-foot elevation change from its high point down to the Ski Bowl, and there is a 1,600-foot drop going from Ive’s Dam on the Schaefer Trail, down to the Ski Bowl via North Creek Reservoir and Rabbit Pond. The North Creek Business Alliance runs a shuttle bus on weekends and holidays that picks up skiers at the Ski Bowl at 11:30am and drives them to the start of the Raymond Brook Ski Trail on Barton Mines Road – a $5 donation is asked. In the southern Adirondacks, a new section of the Northville-Placid Trail in the Shaker Mountain Wild Forest heads southeast from Benson Road for 3.9 miles to a lean-to, next to the 100-foot-wide West Stony Creek. The lean-to was erected in August 2018. The trail is a typical intermediate backcountry ski for over three miles but then drops fairly steeply to the creek and lean-to. Some rocks stick up in the trail and it is best skied when there is well-over a foot of snow. The surrounding mountains are small compared to the mountains up north but they do rise up impressively – 1,000 feet above the creek. 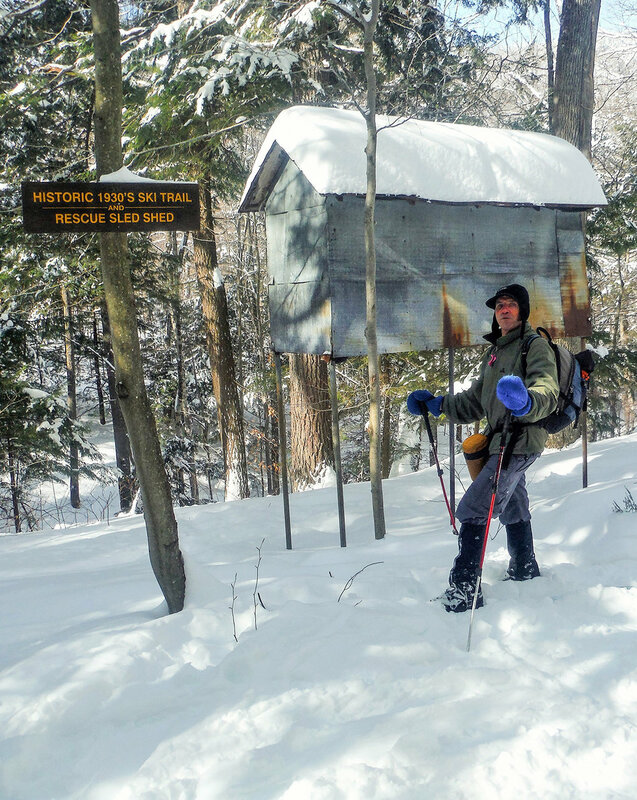 See Bill Ingersoll’s article in the November 2018 issue of Adirondack Sports for more info on the trail. Maps and more information on these locations can usually be found on the DEC website at dec.ny.gov/lands/67299.html. You never know when we will have snow these days, but the Adirondacks are known to have six months of winter so take advantage of any snowcover we have, and enjoy gliding and exploring the beautiful backcountry of upstate New York! A lover of wild places, Rich Macha has led many trips for the Adirondack Mountain Club and has spent 20 years in the paddlesport/snowsport business. More of Rich’s adventures can be found at northeastwild.blogspot.com.